The Cooking Photographer: Stupid Rolo Turtles, Now I Need Bigger Pants. I hate these things. HATE! Super addictive delicious easy horrible stinking Rolo Turtles I curse the day you were created! I curse the creator of such easy deliciousness. Do you hear me? Maybe one more turtle and I’ll be calm enough to start writing. Ok maybe two. (Munch munch..) Ahhh much better. OK, just one more, really. Anyway, you get the picture right? Just stay away from this crack. It’s bad. I already feel the panic inside me growing. I’ve been without Rolo Turtles for ten seconds now. Ten seconds of wasted life. It all started after lunch earlier this week. I wanted something sweet and salty. I had seen these easy little turtles pass through the blogging world. I even had the “recipe” memorized. So I innocently put them together, and something horrible happened! I *gasp* ate the whole cookie sheet full. This is something I never do! The next day about noon I started to get antsy. Wait, be right back.. (Munch chew chomp). OK, so about noon I started to get kind of shaky. I need Rolo Turtles! Five minutes later these dastardly little sweet chewy chocolaty crunchy salty nutty monstrosities were being automatically shoveled into my mouth. My hands were out of control! On their own accord they started shoving these atrocious evil delicious candies into my mouth. My mouth would then be forced to chew, and my throat to swallow. Day three is a repeat of day one and two. Except, I started putting more toppings on them. Peanuts, chocolate covered coffee beans, and almond, peanut, and plain M&M’s joined the original toasted pecans. I even have a special bag for toppings! There is no hope left for me. I’m doomed! I need bigger pants. Don’t start down this road. Just say no to Rolo Turtles. Nancy Reagan will be proud of you. Toasted pecans, M&M’s of any variety, chocolate covered coffee beans, peanuts, etcetera. Preheat oven to 220 degrees. Line a cookie sheet with foil. Place the pretzels on the cookie sheet and top with one Rolo each. Bake for three minutes. Remove from the oven and press on topping of choice. First, eat as many as you can while burning your mouth. Then slide the foil onto the counter and let the chocolate re-solidify. For faster set up, you can move the pan with the candy to the freezer, and chill for about 20 minutes or until firm. Notes: To toast pecans, spread them out on a plate and microwave for 30 seconds at a time. Stir the pecans around with your hand in between cooking times until toasted. I have no idea where this recipe originates from, but if I ever get my hands on that person... Picture and write-up by Laura Flowers. Ok I started the morning cracking up. Of course I am heading out to me a pack of Rolos. My nieces and nephews are going to love these things. The toppings are endless. I would be totally capable of eating an entire tray. These sound incredible! Which topping ended up being your favorite? I would love to make these for a party. Note to self - do not make these dastardly little sweet chewy chocolaty crunchy salty nutty monstrosities while alone! Jajajaj, that's great to know that I am not the only one gaining weight from your blog. The grandsons will be with us in July. This will be one of our cooking adventures. You started my day with a laugh. You are too funny with this. So I carefully avoided really reading the recipe . . .
That was very smart of you. This is WAY too cool. I've already added it to my Christmas candy list for next Christmas!! But.....of course....I HAVE to try them out before then, right? I haven't even tried these and I KNOW they are going to be way too good. I laughed so hard about you having to up your pants size...what a great title for this post. Oh My Goodness!!! I had almost forgotten about these beauties!! 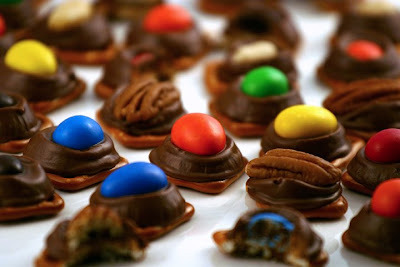 I made these a few years ago for Christmas using chocolate kisses with red and green peanut m&m's...so addicting!! I love that they're so easy to make but have that addicting sweet/salty combo. Great post! Thank heavens I can't find Rolos in Nantes! Whew! I love this post and I would go nuts for these candies, too, as that Rolo combo of chocolate and caramel (am I right?) is my absolute favorite! LOL I love rolos so I will DEFINITELY not be making these!!! Love these! I will have to try them! Thanks for the post - it reminded me all about these great treats! I made them over the weekend with Hershey Kisses and M&Ms. Yum. I love you, but I hate you. I made these today using pecans, almond M&Ms and dry roasted peanuts. I meant to eat NONE & bring them to a family gathering, but I decided to try one. I've now eaten half the tray and figure I'm either going to have to make more or just not bring them to the gathering b/c I the rest of those babies are ALL MINE. I guess you warned me, but I thought I had better willpower. Wouldn't it be nice if we could buy the kisses without the paper wrapper-oh never mind- then we'd be tempted to make more of them! Chocolate is good for you tho! It comes from cocoa BEANS, beans are veggie so it's ok! Thank you for sharing! I sent a FB request too if that’s ok.
Thank-you! I had no idea someone still looked at this post. I made 15 of them for my family yesterday. One of my sisters is already obsessed. She's rang me twice to ask me whether I can make them again. I took some into work and in two days I've had so many more requests for them. Wow these really are addictive! Amazing. Thank you so much, I've never been so popular! That was so fun to hear! Thank-you. Oops, I did it again! Yup, brought a big batch out of the oven and have already eaten 8 of them. They're supposed to be a birthday gift for a guy at Church so hopefully I can keep my hands off of them until they're out of the house b/c I do NOT want to make (and eat) another batch. I've seen this recipe float around a lot on the the food blogs but yours has by far the best write-up of what they (potentially) could be. You see... I started out to make these. I got all the ingredients. It had been YEARS since I had Rolos. Needlessly to say, I got as far as snacking on the rolos before I got to the turtles... so at least you can say you made the recipe! Lol! Omgosh I laugh because I did that the first time too. I had to go buy more Rolos. I laughed until it hurt, then I put your address in my Google Reader. Now I have to go to the store and try to find pretzel snaps; I'd never heard of them! Can someone be in a panic and die laughing at the same time? Barbara yay! I'm so happy I made you laugh. Although I'm not sure you should make these crazy things lol.